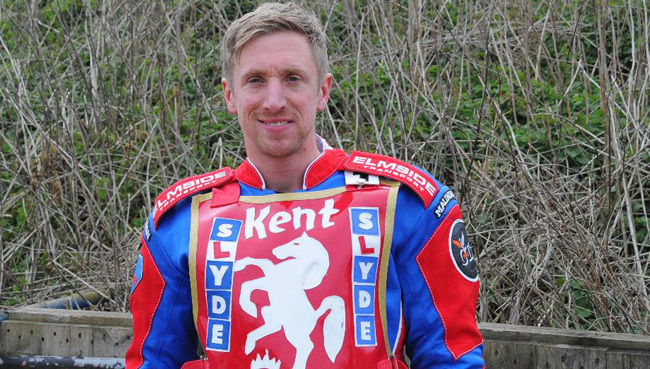 The Kent SLYDE Kings fell short in their quest to make a second successive National Trophy final going down 50-40 to Group ‘A’ make-weights Eastbourne Eagles on Saturday night (26/8). It’s Mildenhall who now go on to contest the Final against Plymouth Devils. Star of the show for the Kings was skipper Luke Bowen who reeled off four wins in his five races; however only two other heat winners and just two heat advantages rather told the story of the evening. After Bowen, in his competitive comeback after a long spell out, stormed to victory in heat one, there was a great scrap in the second race between Bradley Andrews and Matt Bates for the second place. The pair exchanged passes throughout the race before the Kings’ Kiwi reserve lifted on the run to the line and took an alarming fall. It gifted the home team a 5-1 heat advantage which saw them take a lead they never surrendered. Eagles debutant Josh Bailey didn't get off to the best of starts. His opening race got as far as the first corner before he came to grief and was excluded. The rerun saw Tom Brennan get the better of Kings duo Jack Thomas and Dan Greenwood. After an Eastbourne 4-2 in the fourth and a Bowen-led 3-3, there was a dramatic heat six. First off the SLYDE-backed Kings gated on a maximum heat advantage but couldn't really sort themselves out and Andrews was passed by Eastbourne number one Jake Knight. Knight then set after and passed Kent ‘guest’ Richard Hall. Hall then fell and remounted but the drama wasn't done. Going into bend three the lap after, Hall fell; Charley Powell went for the outside run on Andrews; the pair tangled and the home rider was deemed to be at fault. After a shared seven, the home side took control from heats eight to 10 - extending their lead from six points to fourteen at the interval stage. At the start of heat 10 Kent’s recent signing Greenwood gave an impromptu firework display, as his chain came off sending sparks into the Sussex sky. After the interval, there were two shared heats before Kent staged a mini revival in the closing stages. Heat 13 saw another fantastic ride from the ‘Bowen 747’. 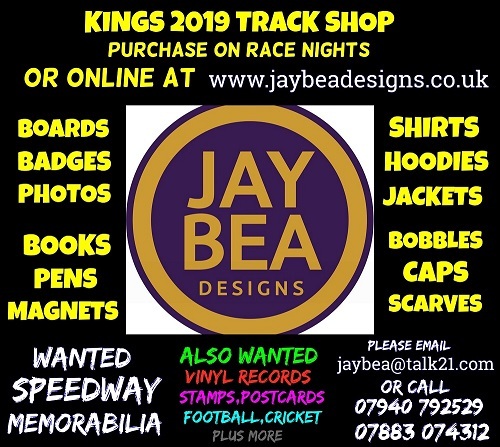 He took off from the tapes and won in the fastest time of the night; however there was drama behind him on the last bend as the chasing Jake Knight took a very spectacular fall, which gave the Kings a 4-2 heat advantage their first of the night. Heat 14 was also incident packed. Kings’ reserve George Hunter took a tumble on the first corner but remounted to carry on. This left Brennan leading from Greenwood. Going into the last lap, the teenaged Eagles rider started to slow thus handing the lead to Greenwood. Hunter was also slowing thinking the race was done but looked up in time to see Brennan grinding to a halt and carried on before limping back into the pits. The end result was a 4-2 to the Kings for a second successive race. That saw the gap down to ten points with the possibility suddenly back on the table that the visitors could gain the bonus point given for a defeat of six points. That scenario didn’t come to pass though (saving the authorities the headache of deciding then on a way to split what would have been two sides tied at the top of Group ‘A’) when though Bowen won again, the final race was shared. So ended another local derby, raced in the right spirit with plenty of incident and good racing. And the fans won't have long to wait before renewing the rivalry, as the two sides go head to head on Bank Holiday Monday at Central Park with a 3pm start – this time in a crucial Travel Plus National League [TPNL] match. Announced as ‘Guest’ coming in for the still-missing Ben Hopwood in this latest Kent-Sussex derby tomorrow will be Mildenhall’s teenage prodigy. Jordan Jenkins.